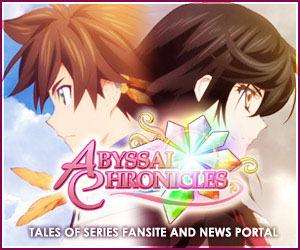 Abyssal Chronicles (AC) is a fan-run website for Bandai Namco Entertainment's Tales of Series RPGs. What started as a small website under free hosting is now one of the biggest fansites and news sources for the Tales of Series on the web. The website covers news from both the Japanese and Western spectrum of the Tales fandom and is currently recognized by Bandai Namco's branches as a source of Tales news for fans. The website was founded by a745/Abby around 10 years ago. Since then, the website has steadily made its way up into what it is now. This we owe very much to our supporters since the bygone age of color-clashing HTML tables and automatic MIDIs playing in the background of the website. Huge contests are held every major title release in the West with prizes courtesy of Bandai Namco as well as our own.